Candidate experience matters: a bad one can damage a company’s brand and profit margins alike. In 2012, CareerBuilder reported that 78 percent of candidates who had a bad experience with an employer would share that experience with friends and family; 32 percent of candidates would be less likely to purchase products from companies that gave them poor candidate experiences. But if you spend your time reading sites like Recruiter.com, you probably knew that already. What you might not have known are the common causes of bad candidate experiences — but thanks to a recent survey from Software Advice, you do now. and no notice when a position was filled (83 percent). and notification when a candidate was passed over for the job (28 percent). Do Recruiters Really Know What Candidates Are Experiencing? What’s most interesting about the survey, in my mind, is the fact that it may suggest a divide between candidates’ and recruiters’ approaches to what constitutes a good candidate experience. 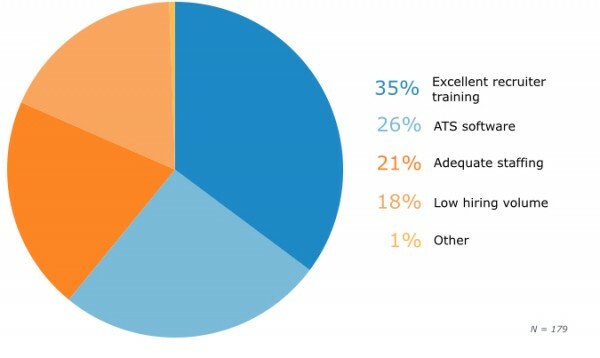 A significant portion of the 191 recruiters surveyed by Software Advice (26 percent) said their ATSs were contributing factors to positive candidate experience. Now, contrast what these recruiters are saying with what candidates themselves are reporting. 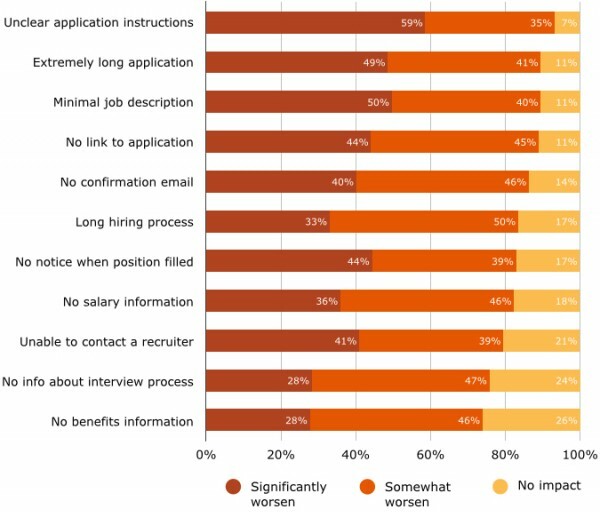 According to a study from Jibe and Kelton Global, 80 percent of job seekers find the online application process “time-consuming and stressful.” This aligns with Software Advice’s own survey results, in which job seekers expressed distaste for extremely long applications (time-consuming) and unclear application instructions (stressful). The disconnect between how recruiters feel about ATSs and how candidates feel about them makes me wonder if recruiters are really seeing candidate experience through the eyes of job seekers. Sure, ATSs make recruiters’ lives easier, but do they always make candidates’ lives easier? It doesn’t seem that way: according to the Jibe/Kelton Global study mentioned above, three in five job seekers say online job applications are more difficult to fill out than mortgage, student loan, or health insurance applications. But enough with the negativity — I believe I’ve proven my point, or at least given you something to think about. Now for the good news. Clearly, not all recruiters believe their ATSs are the keys to candidate experience: 35 percent of them told Software Advice that excellent recruiter training allows them to give candidates a positive experience. Given what people who are far more knowledgeable than I am say, I’m inclined to agree that recruiters make the real difference. Software can help, but it’s not the be-all and end-all. I should also note that a lot of innovation is currently occurring in the ATS space, with many providers adopting social media integration, streamlined designs, and mobile optimization, to name just a few of the trends. This bodes well for the future of the ATS — but for now, I think it’s safer to say that the candidate experience is really in the hands of recruiters, not ATSs. Let me end with a suggestion: recruiters, your ATS may make your life easier, but it may also make your candidates’ lives harder. Use the extra time and energy your ATS frees up for you to ensure that your candidates are having the best experience possible. Don’t wait for the software to do that for you.